San Diego – Downtown / Little Italy / Coronado / Old Town / Misc. SAN DIEGO-based plein air painter, Paul Strahm, brings out the FINE in America’s FINEST City in his vivid, internationally collected paintings. 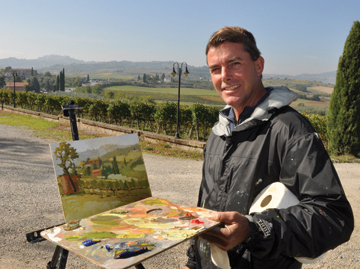 Each image is thoughtfully painted to capture the landscape, lifestyle of the area, and its people. Viewing this fine artist’s work will pull you into the scene —again and again — offering you memories that last a lifetime. Strahm’s passion for painting began when he was young, as did his love for the outdoors. His rural Ohio upbringing allowed him to intimately explore nature on his family’s country farm. After high school, Paul attended Youngstown State University where he studied art and became fascinated with the French Impressionist painter, Paul Cezanne. Cezanne’s study of nature — through his paintings — influenced Strahm and he began to emulate Cezanne’s natural hues and his love of “plein air” painting. Not long after receiving his fine arts degree in painting, Paul moved west to San Diego, a climate very similar to Cezanne’s favorite haunts in the south of France. Strahm enjoys his career here in San Diego, and nearly half his life later he continues to bring joy to everyone who is lucky enough to have one of his paintings. Paul’s plein air paintings, without a doubt, reveal the unmistakable appeal and magnetism of America’s Finest City, San Diego.